All Khalil Mamoon Ice Chamber Hookahs are handmade in Egypt promoting the most traditional smoking experience you can find. The KM Shamadan with Ice Chamber hookah expresses the traditional name that Khalil Mamoon stands for providing a sturdy stem decorated in an exotic silver. 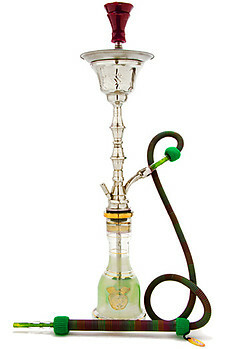 This hookah has great draw and produces a smooth and flavorful smoke. The ice chamber at the top provides a cooling sensation like none other and adds to the stunning appearance.